Luke Fox created WhiteFox Defense Technologies, which detects and intercepts hostile drones to protect people and property. Fox, who grew up in foster care, is also a children’s rights advocate. WhiteFox Defense Technologies, Inc., a drone airspace defense and security company, had their flagship product, DroneFox, participate as selected equipment by the U.S. Government for the prestigious Black Dart counter-UAS and Red Teaming exercise last month. It was the first time WhiteFox had performed testing at Black Dart, the largest counter-drone testing exercise in the world. After only a brief training, military personnel were able to operate DroneFox to effortlessly detect, identify and mitigate drone threats that were sent by a contracted Red Team. WhiteFox participated alongside several Department of Defense organizations and civilian companies after passing the rigorous nine-month down-selection process. As UAS pose a unique and complex threat that requires multiple layers of defense to comprehensively protect, public and private entities were encouraged to work together. Representatives of the U.S. Government saw how WhiteFox engaged with the entities and helped evolve security modeling along with techniques, tactics and procedures. Through the DroneFox user interface, operators were able to perform threat assessments of individual unknown or hostile drones and “whitelist” their own “friendly” drones. The military personnel operating DroneFox then relayed this information to remote personnel performing various ground operations at the exercise. The Department of Defense has hosted the invitation-only exercise since 2004 to test the capabilities of Department of Defense and civilian companies as unmanned aircraft systems (UAS) have become easier to own and use. More than 70 countries now use UAS for government or military applications, according to the Joint Integrated Air and Missile Defense Organization. FBI director Christopher Wray recently told a U.S. Senate panel that the threat from commercial drones “is steadily escalating” even as Congress gives agencies new tools to address these threats. The comments came just days after President Trump signed into law legislation that gives the Department of Homeland Security and the Department of Justice new powers to detect and mitigate drones that pose a threat to government and other sensitive assets. Luke Fox, CEO of WhiteFox Defense Technologies, said: “Drones are becoming an integral part of military forces worldwide. They are being used for research and development, in combat missions, as target decoys and reconnaissance. They are also playing a key role in security, search and rescue missions, communications and munitions. WhiteFox Defense Technologies, Inc. is a drone airspace security company headquartered in California. WhiteFox builds proprietary software and hardware that enables users and institutions to secure their airspace from drone threats. Pioneering the safe integration of drones into society, WhiteFox develops products that save lives, protect property, and safeguard privacy. WhiteFox’s mission is to keep the sky open for responsible pilots, advancing drone technology for the benefit of society. In a constantly changing industry, WhiteFox is pushing the boundaries of what security means. To learn more about WhiteFox or schedule a demo, email info@whitefoxdefense.com or visit www.whitefoxdefense.com. DroneFox is a SWaP-C optimized, portable solution which uses a novel method for tracking and taking temporary control of drones: a “master signal” which allows its operator to choose from a dynamic set of responses including land, return to launch, confiscate, and reroute. Unlike jammers and other non-kinetic products, the DroneFox can select the exact signal it wants to manipulate, without interfering with any others signals—even other drones. The core WhiteFox technology offers critical infrastructure and personnel the ability to protect against reckless drone use, while enabling “friendly” drones to fly freely and continue the work they’re doing to positively impact society. Black Dart 2018 is an annual Department of Defense field demonstration of current and emergent counter-UAS technologies. The event is coordinated and overseen by the Joint Staff J8; Joint Integrated Air and Missile Defense Organization. The training event brings industry personnel, observers from allied nations and military participants from across the Department of Defense. Completion of a second round of funding could help bring closer to market Progentec Diagnostics‘ new tool for predicting lupus flares and a biomarker-based index that monitors underlying disease activity. Funding for Progentec’s biomarker-based diagnostic testing was led by venture capital outfits i2E and OCA Ventures, with participation by global healthcare provider NMC Lifesciences. Using technology created by the Oklahoma Medical Research Foundation, the platform is touted as being able to detect impending flares and track underlying disease movement. NMC Lifesciences brings an integrated multivertical and multibrand private healthcare network that includes 2,000 physicians and 8.5 million patients globally. “NMC is looking forward to a strong symbiotic partnership with Progentec, delivering value all across the healthcare delivery ecosystem,” said Prasanth Manghat, CEO and executive director of NMC Health, parent company of NMC Lifesciences. Oklahoma-based Progentec has also acquired LupusCorner, a patient-centered platform for individuals with lupus nephritis and systemic lupus erythematosus. The company hopes to use the LupusCorner infrastructure to create an innovative and comprehensive lupus management platform. According to Puroshothaman, the addition of LupusCorner and its users will ensure patient participation in the process of creating this platform. LupusCorner uses an array of smartphone-geared tools to help track patient-generated data and health literacy. “We look forward to advancing the platform and fulfilling the unmet need for lupus diagnostics and management tools,” he said. Launched two years ago, LupusCorner was designed to help patients better understand their health and medications by providing clear and accurate information via an online platform shared monthly by roughly 45,000 people living with lupus, a disease that causes the immune system to attack the body’s own tissues. LupusCorner founders Arif Sorathia and Brett Adelman will join Progentec and help direct its efforts. Progentec’s mission is to create and commercialize state-of-the-art diagnostic interventions in therapeutic areas with high levels of unmet need. The company used $1.25 million in earlier financing from OCA Ventures, i2E, and Mayo Clinic Ventures to improve algorithms behind the lupus tools. OKLAHOMA CITY, Oct. 31, 2018 (GLOBE NEWSWIRE) — Progentec Diagnostics, Inc. (“Progentec”), a leader in the development of technological innovations in the field of diagnostics, today announced the completion of a second round of funding led by i2E, along with Chicago-based OCA Ventures and NMC Lifesciences, a leading global healthcare provider. The funding will help bring Progentec’s tool for identifying Lupus flare ups and a biomarker-based disease-activity index closer to commercialization. Technology created by the Oklahoma Medical Research Foundation (OMRF) is at the core of the platform being developed by Progentec. Progentec today also announced the acquisition of LupusCorner, a leading patient-empowerment platform for people with systemic lupus erythematosus (SLE) and lupus nephritis. By integrating LupusCorner’s technology platform and data insights, Progentec is positioned to develop a first-in-class lupus-management platform. The founders of LupusCorner, Arif Sorathia and Brett Adelman, have joined Progentec and will help lead technology, outreach and growth initiatives. Progentec’s technologies include highly accurate bio-marker based tests to diagnose disease before symptoms begin to show, as well as tests to monitor and predict disease activity levels in Lupus. The Lupus Foundation of America estimates that there are as many as 1.5 million lupus (systemic lupus erythematosus or SLE) patients in the U.S. alone. Seen mostly in women between the ages of 15 and 44, lupus causes the immune system to recognize and attack the body’s own tissues. Lupus sufferers have periods of flares and remission with organs typically affected including the skin, kidneys, lungs and reproductive organs, as well as the cardiovascular system. About Progentec Diagnostics, Inc.Progentec Diagnostics, Inc. (“Progentec”) is committed to exploring and commercializing state of the art diagnostic interventions along with digital and social infrastructure to improve access and outcomes for patients in therapeutic areas with a high level of unmet need. By collaborating with research institutions and individuals around the world, Progentec works towards bringing the latest technological innovations to the field of diagnostics. Progentec’s work is rooted in the belief that better diagnostics would not only help in ensuring cost-effective management of diseases, but also help tremendously in reducing the mortality and morbidity associated with these diseases. About LupusCorner LupusCorner is a health management platform for people living with lupus systemic erythematosus and lupus nephritis. With an assortment of smartphone-optimized tools, LupusCorner supports the tracking of patient-generated data, health literacy, and community. Moving Analytics is a startup trying to address socio-economic factors that make it difficult to complete rehab in a traditional brick-and-mortar facility through a tech-enabled home rehab system. From L to R: Medical Alley Association CEO Shaye Mandle, MedCity News Editor in Chief Arundhati Parmar and Moving Analytics CEO Harsh Vathsangam. Every year, millions of people suffer from a cardiac health event, and even though rehabilitation programs have been shown to double a patient’s chances of living another five years, they suffer from high attrition and low participation rates. “The sorry fact is that only 15 percent of patients today participate in rehab because to do so they would have to visit a hospital 36 times,” Moving Analytics CEO Harsh Vathsangam said. The company has developed Movn, a digital cardiac rehab and secondary prevention program that they claim is able to triple participation rates at one-fifth the cost of the the existing standard of care. 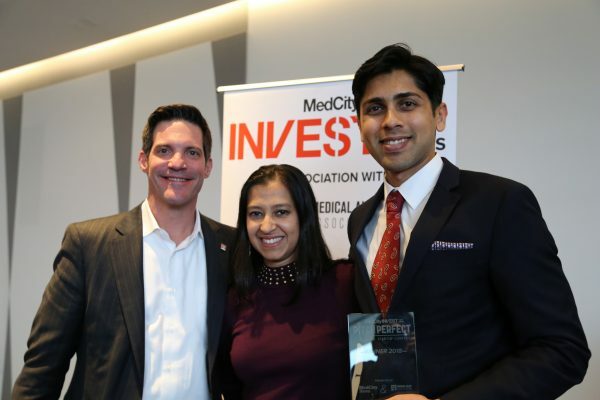 The Los Angeles, California-based company won the MedCity INVEST Twin Cities Pitch Perfect competition earlier this month and in a phone interview Vathsangam expanded on the origins of the company and where it hopes to go in the future. The startup’s technology has its roots in research conducted at the Stanford University School of Medicine that developed a series of treatment plans and algorithms laying how best to manage patients at home with different cardiac symptoms. Where Moving Analytics comes in is by updating that largely paper-based system with modern and adaptive technology including a mobile application, blood pressure cuff and a wireless scale. “What we’ve done since is create a 2.0 version, with a tech platform meant to make delivery of the program seamless,” Vathsangam said. That digital health program includes five major segments: exercise, diet adjustment, medication adherence and customization, stress management an smoking cessation. “The trick is that for each patient it’s not a standard menu, it changes based on how they feel and how well they stick to their care plan,” Vathsangam said. For now the company is focused on working with risk-bearing health systems and hospitals looking to lower costs and transition to value based care contracts. Still, as a small 8-person startup in healthcare, the company has to deal with extended sales cycles that can be difficult to work around. However, Vathsangam said adoption is growing and he hopes to be in 20 hospitals by the end of the year. Part of the reason the company decided to participate in Pitch Perfect was to create a level of validation with top notch investors that can used to create buzz and momentum ahead of a planned Series A fundraise next year.